I appreciate shopping on line very much due to the fact that I hardly got the time and also every time going for a shopping trip, it would turn out to be like chasing games, hide and seek with my two active daughters. Just yesterday I brought my mum together with my two little young girls to children and lady's departments thinking of buying some new shoes and clothes, instead of looking for clothes I have to keep looking for them as they like to hide in between the lines of clothing which basically cover them. I get so tense keep looking out for them all the time. At last I tell myself, I would be more relax and make better choices with shopping on line at the comfort of my home. My favourite on line shop is shopwiki where I can virtually find all kinds of women's wordrobe needs, ranging from designers' fashion to eco-friendly choices, fashion and trendy selections to figure flattering clothes for women, and all kind of accessories too, you name it shopwiki will have them in store for you. I am particularly interested in the eco-friendly selections, it is fairly new to me and what attracted me to these clothes are that they are made with organic raw materials, with no pesticide, harmful chemical and bleaches substances in them. These clothes are made with environmental friendly in mind. This trend will catch up in the fashion industry in no time. The 18 year old, Stefania Fernandez, was crowned as the winner of Miss Universe 2009 in Bahamas on Sunday, 23rd August 2009. Last year's winner, Miss Dayana Mendoza was also from Venezuela. Miss Fernandez is such a beauty in a stunning red gown. Congratulations!! Our niece, Kathleen, came visit us today, and our girls are shouting with joy because we have been waiting to have her around. Kathleen brought along two VCDs. Their afternoon were filled with activities. They watched VCDs, surfing the web, colouring, blowing bubbles, sharing "junked" food (keropok & jellies), decorating cup cakes, went to church and had dinner together after the mass. Pearl was so exhausted that she dosed off right after dinner at the shop. Too excited to having Kathleen around that she did not take her afternoon nap. 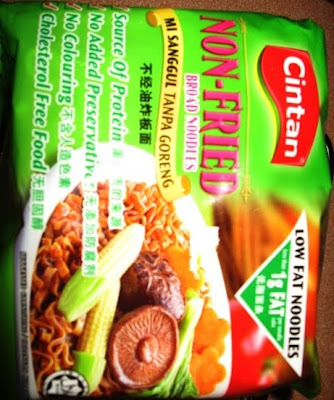 Since our girls like noodles over rice, this time I tried the Cintan brand non fried broad noodles, sound like healthier cos it's non fried, low fat and cholesterol free. 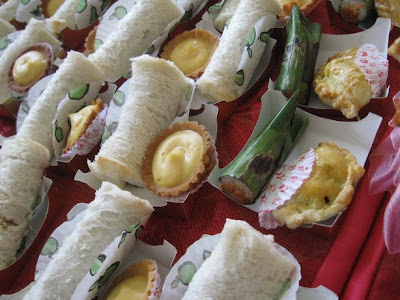 I added some cut four colour rolls, siu mai and vegetable. 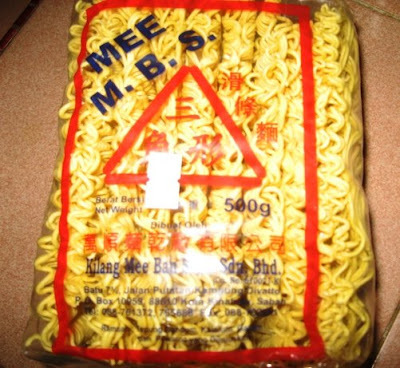 They did not finish their mee cos they do not like the shape, it's broad and flat in shape instead of round. Very fussy! Petronas Methanol (Labuan) Sdn. Bhd. We were having hard time to organise our food on the table when the food came. The table is too small even for a set meal, we kept arranging our plates and drinks for the whole of our dinner time. Overall, we enjoyed the night in an relaxing open air environment with the live band, we will have to think twice for the food we are going to order if we were to have our meals there, not going to keep arranging the plates, glasses and everything else again. 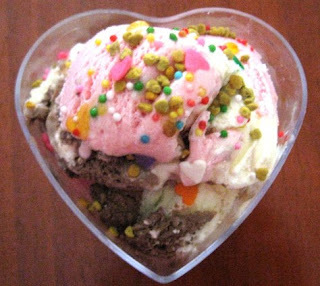 2 scoops of vanilla, chocolate and strawberry flavour ice cream with bee pollen granules, tiny little round and heart shape sprinkles and some flax seed oil. This is the little heart shape gift container from our cousin 's wedding that can be converted into a ice cream serving cup which was mentioned in my previous post. This little serving cup is only good enough for little kids. 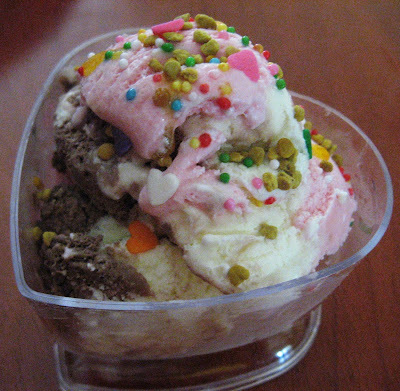 Crystal asked for 2 servings as it was too little ice cream for her. I enrolled my daughter to a piano school when she was 4 years old thinking that she would be able to master the piano skills from very young age. I have heard so much of young children started off with their piano lessons and become great pianist when they grew up. I like my daughter to have this musical skill too..
With great enthusiasm, I accompanied her to all her piano lessons, she enjoyed the lessons at the beginning and her interest faded away after 3 months. We noticed that she started having difficulties in recognizing and memorising the more complicated musical notes many weeks into the lessons. She lost the coordination in hitting the right notes again and again. That's frustrated her and myself too...It is so discouraging that she refused to attend the classes after that. Only recently I got to know about a course call Piano Sight Reading which helps young children and adults alike in overcoming the common hindrances in playing piano which was never being taught in the musical school which my daughter attended previously. The Piano Sight Reading course has its proven and effective step by step piano playing secret techniques thereby has helped many students in improving and mastering their piano playing and read music skills. A friend of mine described to me how grateful she and her son have benefited from this course. 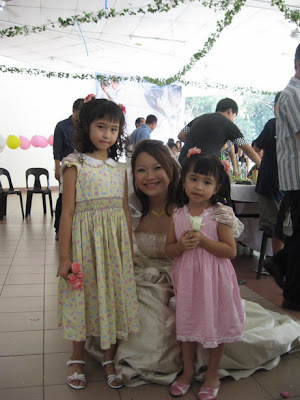 It has helped her son in becoming a professional pianist to a popular group in London now and it is also a dream come true that she is now a piano teacher applying the same techniques, seeing her students excel meant a lot to her. I will definitely enroll my daughters to this course if they are ready to learn piano again. Yesterday was a popular day to wed. My cousin picked the 8th August to wed as well. It was a church wedding followed by a nice and cozy cocktail and lunch party at the church hall, a simple and relaxing party with plenty of food. It was also an occasion for us to mingle around with cousins whom we have not seen quite a while. 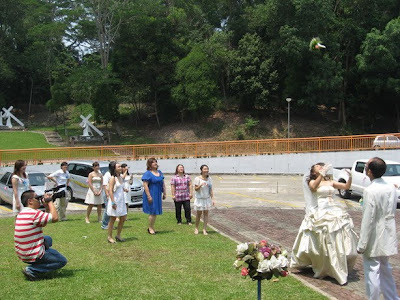 The bride throwing her wedding bouquet up in the sky...hahaha..the nearest lady got it. 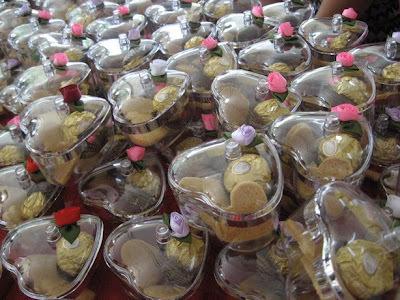 A little heart shape gift box filled with cookies and Ferrerro Rocher for guest to bring home, the heart shape can also be converted into an ice cream serving cup. Our girls always fell very hungry after their afternoon school. Usually the daddy would buy some bread or cakes for them to eat before dinner, because dinner time would have to wait for another two hours away if I were to cook at home after coming back from work. 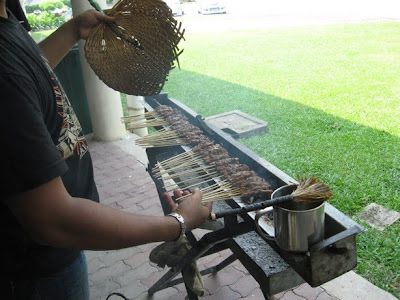 Since the problem of H1N1, I prefer to dine in than dine out. 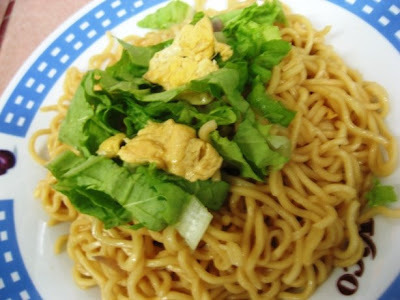 On our way home yesterday, Crystal asked for fried mee. 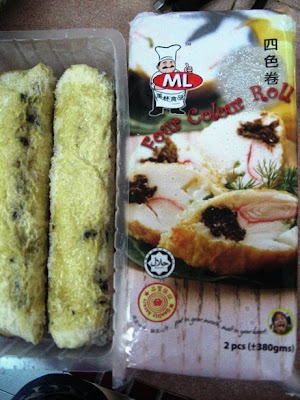 The stock of mee at home has exhausted many days ago that I have to stopped by the supermaket to buy some more. 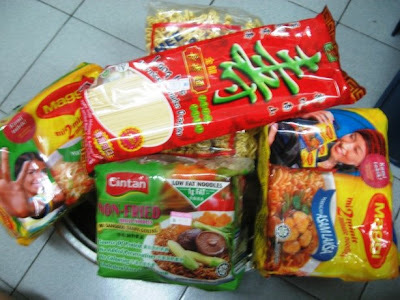 Unfortunately I could not find the brand that we used to buy at this small scale supermarket, so in order not waste time going to other supermarket, I picked up a few types of mee from the shelf. 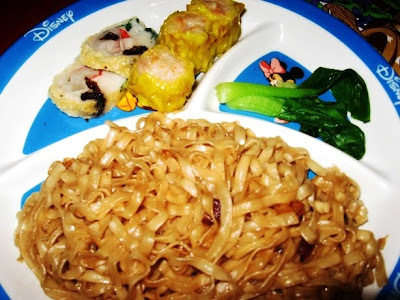 and here is the fried mee for our dinner yesterday too plain that Pearl asked for "row row" (meat) but Crystal finished her plate of mee without complaint.